When it comes to scaling high-growth tech and media companies, Simon Bax has an enviable track record. As EVP/CFO at Pixar, he worked directly with Steve Jobs and played an instrumental role in Disney’s $7.4bn acquisition of Pixar. Following that, Simon leapt successfully into entrepreneurship as Founder and CEO of global technology services company, Encompass Digital Media, which he grew from start-up to over 1,000 employees and revenues of approximately $300mn before selling it to private equity house Court Square Capital in 2012. 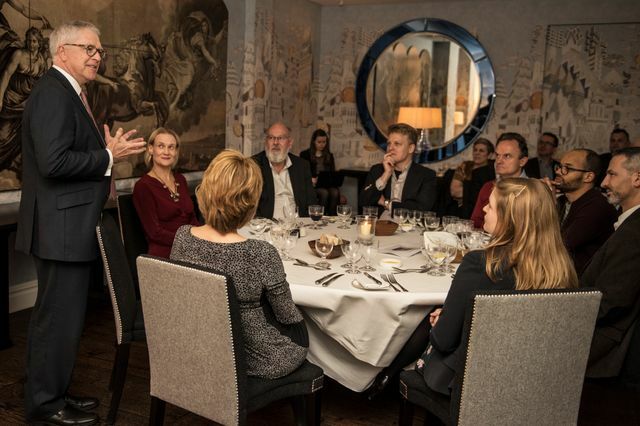 FirstCapital was delighted to have Simon as the keynote speaker and guest of honour at our Smarter Connections dinner on Thursday 12th April. This was the latest in our invite-only CEO dinner series, which has previously featured speakers such as Deborah Magid, Director of Software Strategy for IBM, Jos White, Founder of Message Labs and Notion Capital, Martin Leuw, former CEO of Iris Software, and others. In summer 2006, once Simon’s role in selling Pixar to Disney had been completed, he was looking for the next opportunity. Reluctant to continue down the CFO path, Simon decided to start something himself. He began to meet with various private equity firms in the San Francisco Bay Area to pitch his ideas. His big insight was that the TV industry was shifting from hardware to software and that OTT was becoming a major threat/opportunity, so TV broadcasters would increasingly need to outsource technology to keep up. His idea was to found a global technology services business to meet this demand. What was critical at this stage was Simon’s clear vision of the business’s position in the market. When he succeeded in securing funding, it was because he had pitched Encompass Digital Media as a “sticky business” – what the funders liked was its recurring revenues and long term contracts. Though the decline of linear TV concerned many, Simon was able to convince equity partners that with scale, Encompass would be able to dominate the market on a global basis, which was an attractive proposition. Just as Encompass reached the last stage of a crucial commercial deal which would trigger a requirement for substantial funding, and with just 5 open points left to agree, Simon’s funding partner pulled out. Simon kept his nerve, and proceeded to successfully negotiate the deal, leaving him in need of funding, fast. Luckily, Simon was able to call on his network for a plan B. An acquaintance recommended he meet with a contact in Los Angeles and, over a game of golf, Simon was able to negotiate the funding he needed. Lesson learned? Connections matter, especially when it comes to great deal-making. During negotiations for one particular acquisition over Christmas, where the seller had insisted on a short deadline of 31st December to close, Simon was unhappy with the information the seller had provided. Willing to risk losing the deal, even though it was a critical component of his overall strategy, he asked for more time in order to satisfy himself and to close the deal. The seller conceded, and the deal was successfully concluded a few weeks later, providing Encompass with a key part of its roll out and global platform. Simon learned a lot about great leadership while working with Steve Jobs during his time at Pixar. Though he was initially intimidated by the idea of working with one of the most highly regarded CEOs and tech innovators of our generation, he quickly understood that Jobs respected people who disagreed with him – as long as they could argue their case. By offering challenging but common-sense commercial perspectives, Simon successfully built a strong working relationship with Jobs, and was rewarded with complete freedom in key areas of responsibility, including meeting with and communicating with investors. As they both worked together on the Disney-Pixar deal, Simon came to understand the importance of preserving the values of what made the Pixar business unique. He confided in Jobs about the acquisition: “Intellectually, it’s the right thing to do, but from my heart, I worry about what Disney will do to the culture of the place.” The solution they came up with was to write terms on preserving Pixar’s unique company culture into the deal contract, retaining the values of the business without jeopardising the transaction, a clause which was honoured by Disney post-transaction. If you are interested in being invited to our next Smarter Connections dinner, get in touch or follow our blog for updates.